A bipartisan campaign is underway to try and get more people to take advantage of some high-tech voting equipment the state has available at all polling sites. 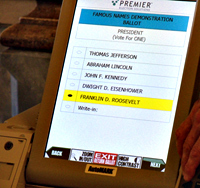 The AutoMARK ballot system (pictured) allows a voter to magnify the ballot on a touch screen, or listen privately as the machine reads the candidates. The radio and TV public service campaign features Michael Barber, president of the Iowa chapter of the National Federation of the Blind. Barber says for years blind Iowans had to have someone else help them vote. Barber says when he first voted back when he was 18, he had to take his mother along to help him vote. He says he was intimidated by that because his mom would know who he voted for, but he still wanted to vote. Secretary of State Micheal Mauro says the machines are not just for the blind, they are for anyone who needs a little extra help to cast their vote by themselves. He says its about being able to magnify the ballot for those who have a little trouble seeing. Mauro says it will help people who have trouble marking the small oval on the ballot, or who have trouble holding a pencil. Mauro says county auditors have long kept magnifying glasses at the polling places to help some people read the ballot, or brought ballots to the curbside so people could fill them out. Mauro says they want people to know the machines now handle many past problems and allow you to vote by yourself. He says their goal is to put the machines to use, as they cost money to have them and it’s important that people take advantage of them to be able to vote independently. The machines also include a “sip and puff” feature, so someone who can’t use their hands can still be able to vote. Jones County Auditor Janine Sulzner is appearing in the public service announcements with Mauro and Barber to explain how the machines work.